Buy Nivea & Himalaya products at best price at 1MG. There is no need to apply any code to get this offer. Product starts at Rs.199. This offer is valid for all users. This offer is valid only on landing page. 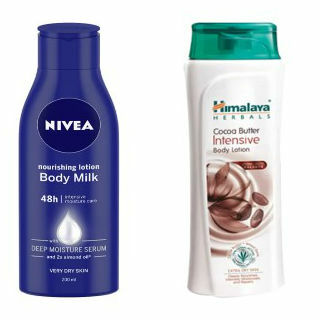 A user can shop for Nivea body lotion, Himalaya nourishing body lotion, Himalaya nourishing body lotion, Himalaya aloe & cucumber refreshing body lotion, Nivea whitening cool sensation body lotion, NIvea cocoa nourish body lotion, Nivea aloe hydration body lotion, Nivea aloe hydration body lotion pack of 2, Nivea Extra whitening cell repair body lotion spf 15 pack of 2 and much more. This offer is valid for the limited period so shop now and make the most of this offer.